Israel Police investigate whether incendiary balloons found in Jerusalem yard were sent from neighboring Arab town. Two incendiary balloons landed on Friday in the courtyard of a home in Jerusalem's Gilo neighborhood. The helium balloons were attached to several matches and fabric soaked in flammable material. Israel Police are investigating whether the balloons were prepared by residents of the Jerusalem-area Arab town of Beit Jala. Police sappers arrived at the scene to handle the explosives. No damage was caused. 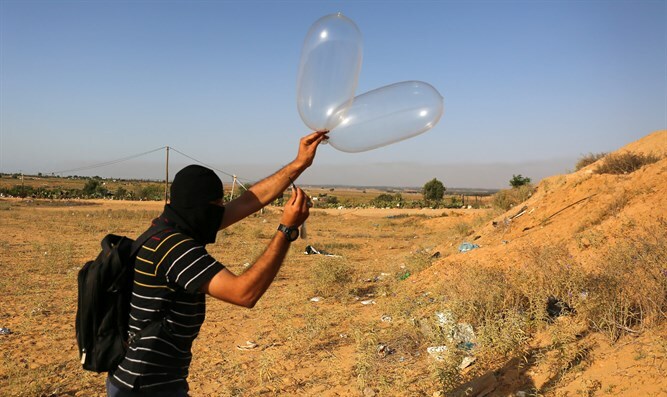 Earlier this week, the IDF began implementing a technological system for shooting down incendiary balloons sent from Gaza into Israel. The new optoelectronic system identifies the balloons and their exact locations. Drones are then sent to cut the balloons and neutralize the danger.